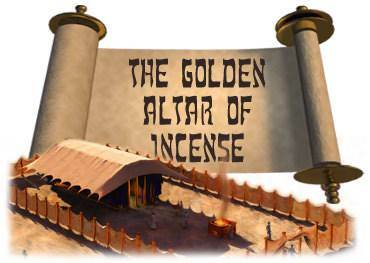 The Altar of Incense stood in the Holy Place, in front of the entrance into the Holy of Holies. Its position was "before the veil" which separated the Holy Place from the Holy of Holies. 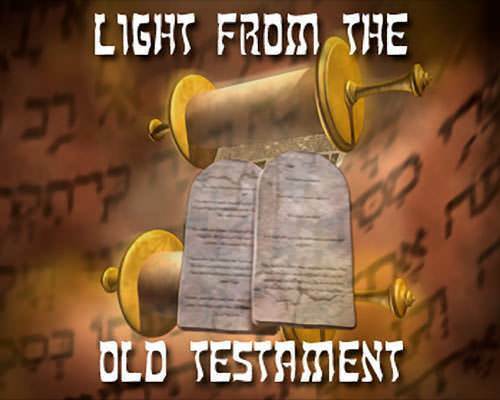 (See this Scripture passage: Exodus 30:1-10—click link). It was a small piece of furniture, about 18 inches square and about 3 feet high. It was made of acacia wood overlaid with gold. It had a "crown" or border of gold around the top of the table to prevent the fire from falling off. The Golden Altar had gold rings at each corner. Staves of wood, overlaid with gold, were provided so that the altar could be carried as the children of Israel moved about in the desert. The purpose of the Altar of Incense was to hold the hot coals of fire, taken from the Brazen Altar, over which the priest sprinkled incense every morning and every evening. The incense was composed of four spices, prepared according to God's command. As this incense was cast upon the fire, a holy perfume rose to God, which was well pleasing to Him. 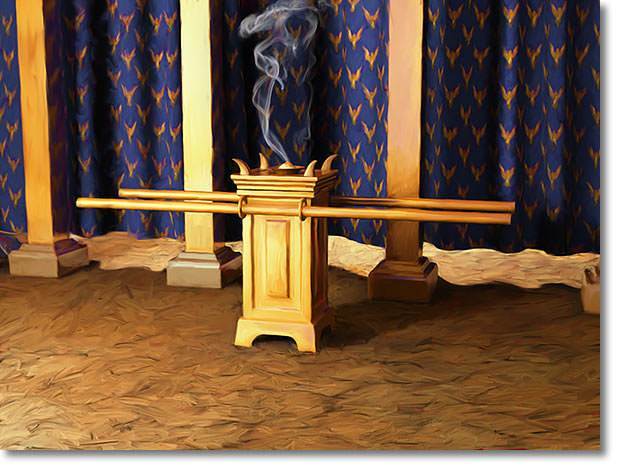 The Golden altar of Incense points to the glorified Christ, our great High Priest who ever lives to make intercession for His saints. It also points to the prayers which believers are able to offer to God by virtue of their relationship to Christ. The wood and gold point as always to the God-man, the wood speaking of His perfect humanity and the gold pointing to His deity. 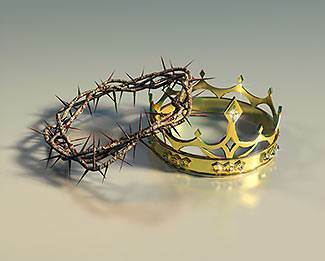 When Christ was here in the flesh, men crowned Him with a crown of thorns. In heaven the glorified Christ has been crowned with glory and honor by God Himself. 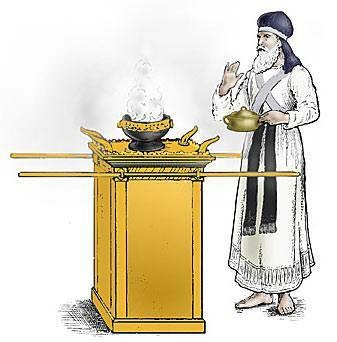 The value of the Golden Altar was in the incense, which points to Christ as the One who is well-pleasing to God. This mysterious compound was made carefully from equal parts of four ingredients, as specified by God. Each of these ingredients spoke of some aspect of Christ. This incense alone was holy and acceptable to God. "See that you make none like it" was His command. What does this tell us? It tells us that there is only one Man who is accepted with God and that Man is Christ. "For there is one God, and one mediator between God and men, the man Christ Jesus" (1 Timothy 2:5). 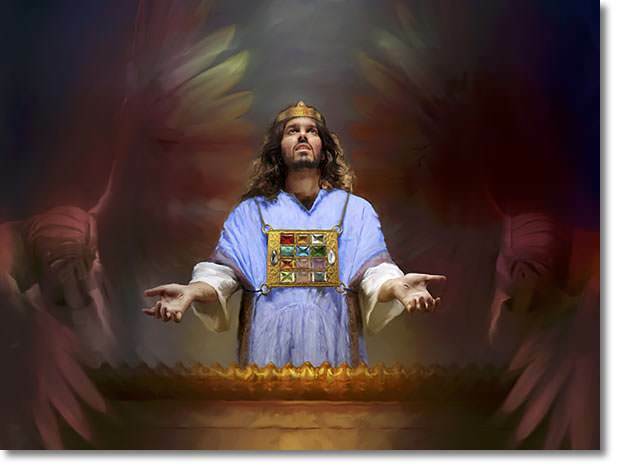 The Golden Altar points to Christ's second great work for us which He is doing now. He is praying and interceding for His saints on earth. But no one can ever get the benefit of His second work, typified by the Golden Altar, unless they have first accepted what He has done for them at the Brazen Altar. We should note also that the incense of the Golden Altar was caused to rise by being ignited by coals of fire from the Brazen Altar. The Brazen Altar speaks of the cross where Christ put away our sins. Beloved, if our hearts are filled with self-love, with the love of money, the love of pleasure, the love of the world and the things of the world, we are not glorying in Christ and His cross. There are therefore no burning coals from the Brazen Altar to cause our prayers to rise to God. By God's grace may we be delivered from these things so that our prayers may rise to God as the sweet fragrance of Christ.